This week, several different client meeting in Massachusetts resulting in my having a free evening in Natick. Natick is an interesting little town, there’s an old-style downtown that has a few decent restaurants, and then there is the Rt 9 strip. There’s no shortage of places to eat on the strip, but it’s mostly major chains (looking out my hotel window as I write this, I can see a Cheesecake Factory). But nestled amongst the big box stores and malls are a few interesting finds. There’s a Kelly’s Roast Beef inside the Jordan’s Furniture down the way (much like how Jordan’s Reading location has a hidden Richardson’s Dairy location for some good ice cream). 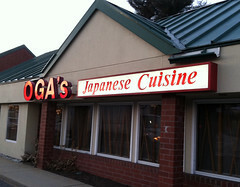 But Oga’s Japanese Cuisine is the sort of place you drive by a lot of times and don’t think of checking out, since it looks little different than, say, a low-grade Chinese place or an office supply sort, at the end of a somewhat dismal strip mall with one of those annoyingly small one-way parking lots. But several online sources gave the place good reviews, and I’ve been in a mood for Japanese food, so I decided to check it out, especially since I’ve again grown a bit bored with the selection at our local sushi place in NH (Yama, which is actually a Korean place, but has a decent sushi selection). From the start, Oga’s is a place that shows that the outside looks can be deceiving, since once you walk in from the parking lot, the interior is immediately pleasant and inviting, with both a large, fairly open dining room and a long sushi bar. Being by myself, I opted to sit at the bar so I could talk with the sushi chefs, who immediately recommended the daily sashimi special. 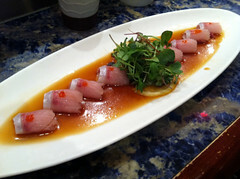 I decided that would be a good place to start, as well as some Hamachi Usuzukuri and some Sake Ishiyaki Don. First up, however, was my order of Hamachi Usuzukuri, due to the relatively simple preparation: thinly sliced yellowtail (nicely sliced with just a hint of skin) in a ponzu, sriracha, and sesame oil sauce with some lemon slices. 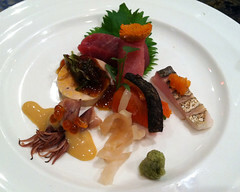 Very nicely done, especially since I always like the combination of yellowtail, citrus, and chili (one of my local sushi places used to have a nice special that was yellowtail sashimi layered with really thinly sliced lemon and jalapeno, which I still miss.) A very pleasant start to the meal, with just enough tanginess from the ponzu and some kick to the sriracha to give it a nice depth. Then the second course: my daily sashimi special. This was quite the elaborate assortments, since there ended up being a a little bit of everything in here, including some little squids on the bottom left, some unagi, some roe, and several nicely cut pieces of tuna and salmon. This is where I’ll admit I should have asked my server a few more questions, since I’m not entirely sure what a few of the remaining items were (maybe some of my readers can help me out here), but they were nicely prepared and very delicious. And for a final nice little touch? It was served up with genuine wasabi instead of the fake horseradish stuff. I always love the more subtle and vegetal taste of real wasabi, on the rare times I see it (I last encountered it at Sushi Ran in Sausalito, CA). 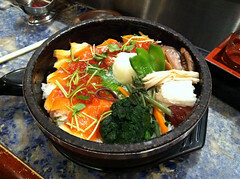 I followed this with my entree, the Sake Ishiyaki Don: salmon and roe with vegetables served on rice in a hot stone bowl. The salmon was as good as the other sashimi I had, picking up a nice light sear from the hot bowl. The vegetables were nicely cooked (most simmered in sauce), and the sushi rice perfectly done and just the right level of stickiness. I always love these sorts of dishes, since the hot bowl sears the rice so you end up with a sort of “donburi meets paella” thing going on, with the rice forming nice little tasty lumps that are just firm enough that you can nicely eat them with your chopsticks, only using your spoon to scrape up the slightly charred yummy bits of rice from the bowl. Overall, I really enjoyed my dinner at Oga’s. The food was well above average (indeed, those that know me know that for food allergy-related reasons, I usually avoid seafood unless it’s immaculately fresh and well prepared, but here I decided it was worth the risk), the staff friendly, and the prices quite good for the quality and variety. This is definitely on my short list for my next visit. Or get takeout, since they seem to do a land office business with the takeout crowd as well.